This is a classic white Bordeaux blend of 75% Sauvignon Blanc and 25% Semillon. It is softer than many of the popular, in-your-face Sauvignon Blancs out there, so it’s a good wine to share with friends who aren’t totally in love with SB yet. It’s a light, refreshing wine with a bit of a floral nose. It’s crisp with apple and lemon (instead of grapefruit) — with its slight sweetness, this would be delicious paired with Thai food or seafood. Available in the grocery store for around $7, I would call this a best buy! The grapes are grown in a combination of clay and limestone soils. 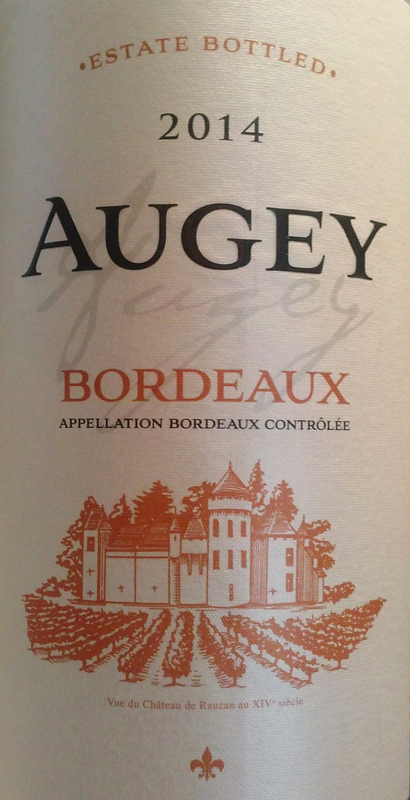 Augey White Bordeaux is a blend of 75% Sauvignon Blanc and 25% Semillion with fresh aromas of citrus, apples and a hint of gooseberry. The crisp fruity flavors pair well with fish, chicken, salads, or goat cheese. This entry was posted in France, Sauvignon Blanc, Semillon, White Blend. Bookmark the permalink. I absolutely love this wine. I totally agree with your review.